I love these villages Jilly, but don't you think that some have been restored to a state that is not in original keeping. Airole has been a victim of this over the years with the Dutch,Germans etc. buying up the ruins and renovating rather than restoring these wonderful buildings. I think the Italians, too late, are now taking steps in what can and can't be done. Eze is a typical example I feel of over the top renovation and has tended to lose some of it's medieval charm. Graeme, I so agree. Eze and also St.Paul de Vence are incredibly over-restored, full of tourist shops and of course, therefore, overrun with tourists too. La Turbie less so although there are parts that aren't so pleasing. The chi-chi-ing up of villages. Not always good. La Turbie is happily tucked away from the main way thru the place and perhaps avoids the worst but it's still too over-restored for my personal taste and right, loses some of its medieval charm. It's a little too perfect perhaps. Gorbio is still very much a natural village but I do notice a couple of houses have been done up in a modern way, absolutely not in keeping with a medieval village. I love the flower pots and cozy feeling in that small area! Say, the prince is getting married in just a month..... are your camera and wedding outfit ready? This is a challenging debate: restoration vs renovation. 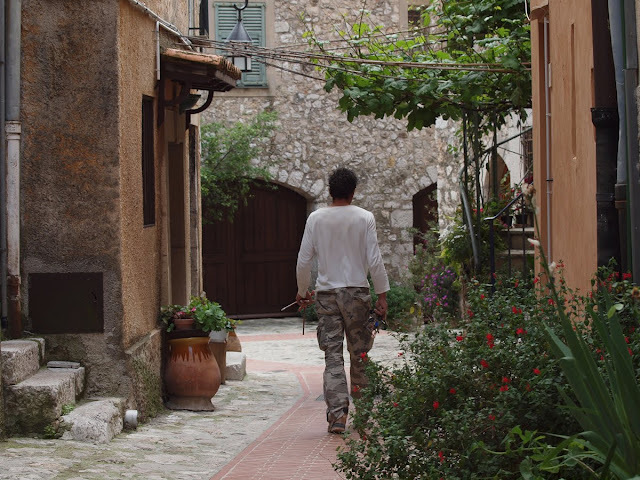 Why should one restore a medieval village to its original state? Indeed, that is not even possible considering the change in requirements for house safety, the installation of electricity, and the cabling required for networked broadband. And there is the change in social mores where children no longer sleep all in the same room, and bathrooms are considered essential. I can understand that restoration of the externals and renovation of the internals is the way to go. As for this young man, please may he keep his camos on!! In his left hand he has a chisel and possibly a couple of screwdrivers, but what is that device in his right hand? Perhaps something for trundling heavy potplants out of the way? When I visit, can you bring the other half out, please? Julie, I think the facade of a building can be restored to look the same as the original. We have amazing artisans here who work in stone. Electricity is often exterior and so it shows but that can't be helped. I'm really talking about the stonework and colours that should be as was if possible. Often a restorationis simply too modern. We don't have cabling for networked broadband! - I wish... ours comes through the telephone lines. He's got a large bunch of keys in his right hand, by the way.